One of the most inspiring tales of overcoming adversity is about to hit bookstores everywhere. SAINT PAUL, Minn., July 25, 2012 /Christian Newswire/ -- Afflicted with life-threatening colitis, crippling rheumatoid arthritis, total blindness, severe stuttering, and life expectancy of 13 years, Jeff Smith, now 55, overcame insurmountable odds to become a successful magician and motivational speaker. The art of magic is an unlikely career for someone blind with limited dexterity. Yet, with perseverance, optimism, and a natural gift for comedy, Smith (a.k.a. Amazing Jeffo) has wowed more than 3,500 live audiences, in addition to TV and radio shows. He has brought his testimony of hope to hundreds of thousands. 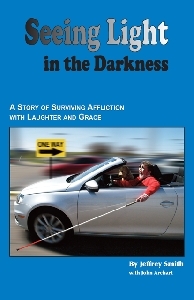 Now, his book, "Seeing Light in the Darkness: A Story of Surviving Affliction with Laughter and Grace," chronicles the story that has encouraged so many. "Being created so different from the 'mainstream' has given me a sense of precious uniqueness," Smith attests, "and an understanding of being 'fearfully and wonderfully made,' as is really the case with all of us." He believes in surrounding yourself with encouragers and not letting negative thinking be your master. "A disability, or any adversity, does not define you, it only describes you," he says. The message of his book is that adversity doesn't have to be defeating. He encourages others to see their circumstances as purposeful and not coincidental, to be open to God's calling on their lives. "Behind it all, there is purpose," he says. "For me, that purpose is to see God doing a mighty work through me, beyond anything I imagined. God can work through any situation." He quotes songwriter Laura Story, "What if trials of this life are Your mercies in disguise?" "Good evening, Ladies and Gentlemen!," he spouts. "I am Amazing Jeffo, a magician who happens to be blind…long time, no see!" "He transforms me before everyone's eyes in the public arena, where I transcend my physical limitations," Smith reflects. "My medical conditions and life experiences have illustrated God's complex but perfect plan…. Though I wouldn't have wished it on myself, in retrospect, I wouldn't have had it any other way." Amazing Jeffo lives in Minnesota with his wife, Devon, and their faithful, 4-legged "son," Krypto.